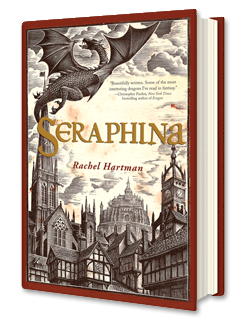 I've had several people recommend Hartman's Seraphina to me, so when I saw it on a library trip I had to pick it up. Hartman's novel is a dragon focused fantasy. The people of Goredd made a truce with dragon kind 40 years ago and as the anniversary approaches things are tense. Dragons are forced take a human form and wear a bell to identify themselves as such, though their lack of emotions does that well enough. Humans are distrustful, seeing as how dragons used to have an appetite for humans and one of the royal family was recently murdered in ways dragons used to kill. Seraphina, the title character, walks a thin line between the two sides. She's one of the impossible results of illegal relationships - the daughter of a dragon mother and human father. It's her closely guarded secret and it's a hard one to keep; Seraphina has scales on her stomach and arm, imaginary people wondering around in her mind, and memory dumps from her dead mother that force her to pass out. Her secret is harder to keep when she feels compelled to share her views on dragons with the princess in an effort to dismiss the draconian nature of the recent royal death. Certainly it's a set-up, isn't? But her dragon music teacher gives warning of a rouge dragon in the area and Seraphina's knowledge of dragons has her involved in the investigation. I loved the world building here - dragons fighting each other with flames because they are flammable, the details of a peace treaty, a parthenon saints, the whole strict emotional nature of dragons themselves. I've always loved books where you can see cultures mingling, probably cuz I love such situations personally, and Hartman does it well.